A building site or premises with tools, materials, plant and other machinery lying around can be very inviting to a thief - additionally the site can be a route to break into adjacent properties. 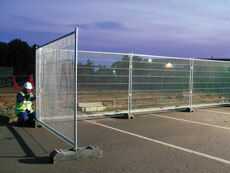 These temporary 2.85m wide mesh panels improve site security with a cost-effective deterrent to theft and vandalism. Supplied with rubber feet and stabilisers, the strong close mesh provides a secure barrier. Fencing is now a H&S necessity to keep the public out and protect them from site hazards.